Since last year, SEO has changed considerably, with poor quality sites being pushed down the rankings due to bad link practices, low-quality content and the use of black hat techniques. This is great news for professional SEOs, as it means that the amount of SEO scammers will be reduced, though no doubt plenty will remain. However, it’s also meant that there’s a lot of conflicting information being bandied around, especially surrounding links. As many of us know, link building takes skill as well as a fair amount of time. Many are extolling, quite rightfully, the virtues of excellent content, but this doesn’t mean that links aren’t still important to SEO, they are. This is a huge part of the job of the SEO professional since April 2012 and if you haven’t already, a site audit should be carried out to look at the state of links and anchor text. Of course, it’s also wise to carry out reputation management and getting a good social presence sorted out too. One of the first areas to look at should be anchor text as this is one that has been much abused in the past. It’s also safe to say that many sites have made the mistake of using the same anchor text repeatedly, which isn’t best practice. This can be done using Open Site Explorer and should be carried out for page level links and anchor text, as well as backlink text and landing pages. Ideally anchor text distribution should be as natural as possible, using variations of branding terms and titles to create them. It’s also not a terrible idea to link using generic words such as “website”, “here”, “this site” and so on, as this will make anchor text distribution look a lot more natural. As a rule of thumb, it’s generally easier to create natural text as it occurs whilst writing than attempting to force terms in. Guest posts have been an accepted practice of creating backlinks for quite some time and have, in the past, been abused. However, guest posting is an excellent opportunity for link building and it also has value in gaining more organic traffic. However, it’s important to pay attention to anchor text and not just use the same term over and over again. Guest posting can be great for linking back to blogs and specific landing pages using key terms, but again these should be as natural as possible. To check out backlinks and link distribution, have a look at the tool on ahrefs for a visual representation and details on all links. Relevance is paramount then, of content and of links, so ensure that all of the content on the site is relevant to the industry, as well as ensuring that guest posts are placed on industry sites only. Use Google Adwords keyword tool to check what the search engine thinks your site is about. Just type the site into the ‘website’ box, untick “only show ideas closely related to my search times” and hit search. Once you’ve done this, have a look through “keyword ideas” and if all of the suggestions match what the site does and the industry it’s in, then you’re onto a winner. If the suggestions are completely different to the site’s industry, with lots of different terms popping up, you’re on shaky ground. Of course, checking the relevancy of back links will be time consuming, especially if you have a lot of historic data, but it’s worth doing even if you have to visit every site on the list. Then it’s a question of asking for the links to be removed, if the site and its content is completely different to yours. It’s important to have as much diversity as possible when it comes to your link profile. This means using a variety of content such as video, presentations, guest posts, images, infographics and so on to make up internal links and backlinks. Diversifying will protect you from future Google changes to algorithm, as there are bound to be updates that will catch some people out. 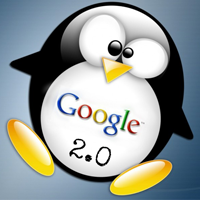 Have you been hit by Penguin 2.0? Let us know in the comments and we are happy to offer advice.